The encroachments by shopkeepers on verandahs of most markets in township is causing inconvenience to the shoppers. 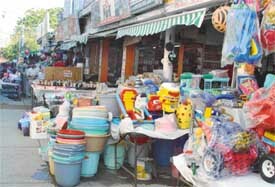 Encroachments by shop owners in markets in Sectors 6, 7, 8, 11 and 15, are not just restricted to the verandahs meant for shoppers, but also extended to the parking spaces in front of shops. A court here today remanded Punjab Congress leader Harbans Kaur, and her son, Sandeep Singh, in judicial custody for two days. Dial DOT for busting illegal exchanges. If you see local or STD number flashing on your mobile screen — or no number at all — while receiving an international call, ring up the Department of Telecommunications (DOT) now. At least, this is what the department authorities are asking you to do. 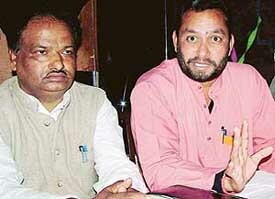 Residents of villages situated around Chandigarh today claimed that the three accused arrested in an alleged land grabbing case were closely associated with PWD Minister Partap Singh Bajwa and his brother Fateh Singh Bajwa. In less than five days after the recovery of a decomposed body from a sewerage treatment plant in Sector 20, here another body was found floating in the same treatment plant, here today. The bid to dig up pitch at the PCA stadium here by members of the Shiv Sena (Bal Thackeray) on the evening of January 10 to sabotage the Indo-Pakistan test match, to be held in the first week of March, was only a step to gain cheap publicity. The city’s hotel owners and guest house owners are at loggerheads. Both sides have petitioned the Deputy Commissioner against each other. 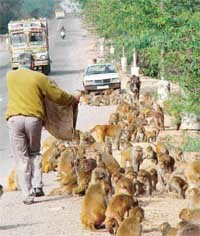 Hundreds of monkeys converging on National Highway- 73 (Panchkula-Naraingarh) from the upper reaches of the Shivaliks are a traffic hazard. The monkey menace in the area is also creating havoc with crops in the fields located in the foothills. The generosity of Hanuman devotees, who believe in feeding monkeys for inviting good fortune, more so on Tuesdays and Fridays, has attracted these monkeys to the highway. These monkeys have now developed a habit to impede each passing vehicle and seek fruit, bread or any other food items. 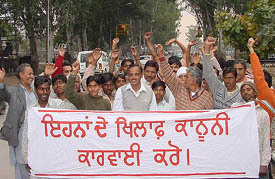 A dharna was organised by members of the Plot Allotment Sangharsh Committee, Sector 76-80, outside the office of the Punjab Urban Planning and Development Authority here today in protest against the failure of the authorities concerned to give them possession of the plots allotted to them. 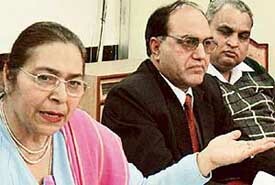 The Municipal Corporation has done away with the legal affairs and enforcement committees. The Mayor yesterday appointed members to all other committees. The art and culture committee has been merged with the roads committee and sewerage has been merged with the water supply committee. The constitution of the committees was held up due to a letter of the Commissioner to the Administration seeking clarification on how many committees were required under the statue. The dream of a local girl, Suman, to be happily married to an NRI settled in the USA has ended in smoke. With the marriage going bust, both parties are levelling allegations and counter-allegations against each other. 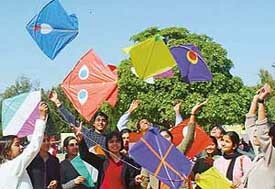 A two-day-long Basant utsav started today at Leisure Valley, here today. It was organised by the Environment Society of India in collaboration with the Tourism Department of the Chandigarh Administration. The Sahayta Welfare Society observed Cancer Survivors Day and International Childhood Cancer Day by holding a function at Tagore Theatre today. Members paid tribute to the courage, determination and resilience of cancer survivors, which included children. Harassed by frequent transfers, the Chief Conservator of Forests, Wild Life Haryana, Mr K.L.Manhas, has moved the Central Administrative Tribunal (CAT) against the Haryana Government. 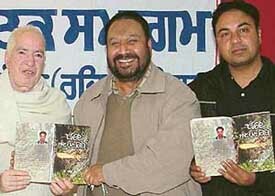 Riding the acclaim of his prize-winning book ‘Mein Zinda Rahanga’ with the IC Nanda Memorial award by Guru Nanak Dev University, young playwright and thespian Dr Sahib Singh has sculpted another social drama book ‘Prinde Hun Jaan Kithhe’ (Where the birds to live). The ICSSR north-west regional centre organised a lecture on ‘Democracy and politics of defection in India’ at Panjab University here today. The keynote address was delivered by Prof Peter Ronald de Souza, senior fellow, Centre for Studies of Developing Societies, Delhi. The Federation of Sector Welfare Association (FOSWAC) has, in a communication to Administrator Gen S.F. Rodrigues, reiterated its stand against encroachments in the city. It has also urged political organisations to rise above “party concerns, personal ambitions and self-centred considerations to deal with the menace of encroachments”. Following the arrest of Cooperatives Inspector and administrator of the Bihta Cooperative Group Housing Society, Mr Ishwar Singh Malik last night, the Kendriya Vidyalaya Sangathan Employees Cooperative Group Housing society today re-elected Mr Didar Singh its President. Mr Malik had been appointed Administrator of the Society. Randhir Malik, an employee of the Ranbaxy, who was injured seriously in a group clash in Sector 40-D Market on February 8, succumbed to his injuries in the PGI early this morning. Two persons, including a girl, were arrested by the police from the Industrial Area here for allegedly indulging in a flesh trade racket. A case in this regard was registered on the complaint of the DSP, Mr Harpreet Singh. Zee Network will begin beaming its 17 channels in Panchkula and neighbouring Mani Majra next week. These channels have been off air since January 28. A decision to this effect was taken at a meeting of cable operators and officials of Zee Network today evening. The decision on the exact date to begin beaming is yet to be taken, and also if cable operators are to be allowed beaming of just one package. Former Canadian minister Herb Dhaliwal said that future generations in India and Pakistan could benefit from cordial ties between the two nations. Mr Dhaliwal was addressing a gathering after inaugurating an immigration consultancy and training institute, Canadian Caregiver Training Institute (CCTI) at Swastik Vihar today. The Association of Private Educational Institutions today criticised the Chandigarh Administration for adopting double standard while giving exemption to schools being run in residential premises. Eurokids, a playway in Sector 18, celebrated its annual song ‘n’ rhyme day on the school premises here today. As many as 60 children of pre-nursery and nursery participated in the event. 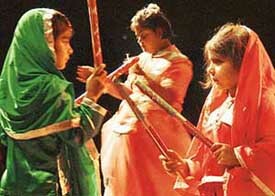 Teachers Shefali, Mansi and Harmohini had taught the children. The Department of Zoology, Panjab University is holding a three-day national seminar on ‘New trends in fishery developments in India’ beginning on February 16 in the ICSSR Complex, P.U. A UGC- sponsored national seminar on “Knowledge Management” concluded today at Sri Guru Gobind Singh College, Sector 26, here. Eminent scholars expressed their views. Dr Dinesh Gupta, faculty members, Panjab University spoke on ‘Creation of enduring knowledge’. “Sheesha” is not a bad idea at all. Only bad thing about this tale of obsession and lust is that it is ugly in execution. Director Ashu Trikha has played fast and loose with the script of twin sisters (Neha Dhupia) falling for the same hunk (Sonu Sood). While the one who is a fashion designer marries him, the other being deaf and dumb hankers for him like a soul-less specie. Mr Pradeep Medhi, a devotional bhajan singer from Shirdi (Maharashtra) who was here to perform at the Shirdi Sai Baba Temple, Sector 29. Pradeep has to his credit many audio cassettes recited for Shirdi Sai Baba both solo and also with singers Anuradha Paudwal, Suresh Wadkar, Mahender Kapoor. Red seems to be the dress code in the Sector 10 tennis stadium not because of forthcoming Valentine Day but due to tennis ‘glamour’ girls from various countries having come to Chandigarh to take part in the ongoing Grade 3 ITF Junior Tennis meet here. The presence of over 100 players from 26 countries 100 have added charm to the atmosphere.